I read that book because some say it's similiar to [b:The Stand|149267|The Stand|Stephen King|http://d.gr-assets.com/books/1213131305s/149267.jpg|1742269]. 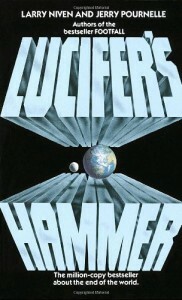 Lucifer's Hammer bears some resemblance to The Stand like apocalypse, following re-grouping and war between two groups. But there are also considerable differences between these books. In my opinion Niven failed to form characters you'll remember because you liked them so much. The characters in this book were very pale and I did not even like them very much. There was nothing special about them. In comparison to that King really created characters you began to be friend with (Stu Redman, Tom Cullen and Nick Andros ...!). I also thought that the developement of the story in the first third of the book lasted too long. When you buy this book you already know the comet will hit. It's the key topic of the book. And then you have to wait until you read 33 % of the book before 'something' really happens. It almost began to make me angry. After that the book was very suspenseful. The aftermath of the Hammerfall is shown presicely and it was depressing me and I thought about buying a lot of canned food. ;-) While I read slow in the first third I now read longer parts. Now the end. It's a bit abrupt ... a bit disaffecting. But on the other hand: it's hard to give a book like this an end.